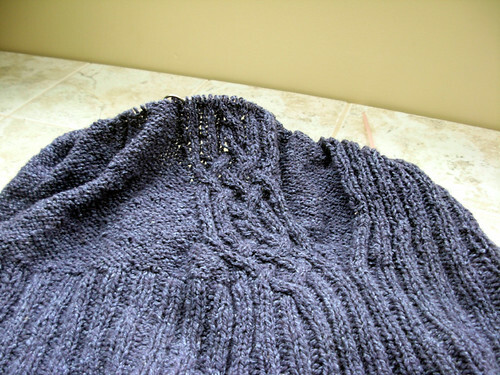 I had hoped to have a finished sweater by Thanksgiving, but time seems to have been conspiring against me. I had also hoped to have posted several weeks ago, but daylight seems to have been conspiring against me there. In fact, time seems to be conspiring against me in general, as I have become convinced that instead of a 24-hour day, I’ve only had a 22-hour day to work with…. I actually knit quite a few rows this weekend, as, for the first time in forever, I had a chance to sit and just knit. I’m hoping for more free time in the coming weeks (I may be dreaming here, it’s the holiday season) so that maybe I can finish by the New Year. It’s been a mild fall, but I will definitely be wanting a new sweater come January! Find me on Ravelry as alittlefuzzy.